Built Area : 250,000 Sq. Ft.
Giga Village is a modern day town center that sits at the intersection of Culture and Technology. Inspired by the call for more pedestrian friendly urban spaces, Giga Village attempts to create a walk worthy urban hub that provides as many possibilities as possible for unfolding human life - through pixels and plazas. Through its design and programming this project attempts to provide a three dimensional community space - where the vibrancy of street life is able to permeate throughout the project. Giga Village is made up of pixels and plazas that are contained within concrete frames spread throughout the site. There are five typologies of pixels used within the project, each with varying built volumes. These pixels are defined by a lattice made of compressed bamboo, they are then layered with sheets of PVC to provide a barrier from wind. The built volume within these pixels is defined by ‘bricks’. The presence of a wooden lattice freed the brick from structural duties allowing for infinite possibilities. Upon entry you are greeted by a mix of DIY craft stores, small handicraft stores, medium sized retail stores, small restaurants, cafes and plazas on the street level. While these programs are contained within pixels, in favorable conditions they begin to percolate beyond the walls, into the plazas where they engage the street life. The second level of the project intersects with the existing transit infrastructure. There are two auxiliary platforms introduced on this level to allow for easier movement between Giga Village and the red line station. These platforms also support transient food carts and craft kiosks to offer quick and varied experiences specially tailored for transiting passengers. This level also houses event spaces, classrooms and, formal & informal galleries. The third level offers maker spaces, digital hubs and co-work spaces for the neighborhood. While these pixels house the various programs offered, in favorable conditions these programs begin to percolate beyond the walls, into the large plazas and engage the public. The three levels are connected together through a vertical connection module where as the horizontal circulation is directed by a series of walkways and plazas, that allow users to explore the spaces at different paces. 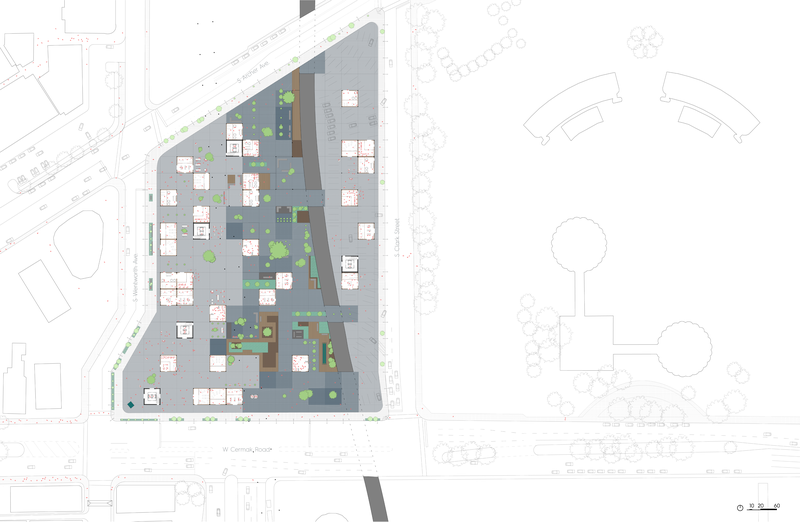 Towards the east, there sits a multipurpose parking space and a landscaped public park runs through the middle of the site, connecting Cermak and Archer. Large sidewalks & plazas make for an inviting pedestrian friendly space. Large plazas as hotspots for Communal Interactions. Varied experiences within the urban park through changing materials. Auxiliary Platforms provide easy access between CTA station and Giga Village. Infrastructural changes to the Metra to provide seamless pedestrian experience. Meandering walkways allow users to explore Giga Village at their own varying pace. The dual metal screens close or open in response to atmospheric temperatures. This helps harvest rainwater, collect snow to create additional insulation, and to improve air circulation in summers. Also has potential to use latent heat to melt and harvest snow - the purest of all types of precipitation. The wooden lattice frees brick from its structural responsibilities, opening up new possibilities. The fabric curtains serve as shades in the summer. In the winter they transform into solid walls as water accumulates and freezes. Living bricks are microcosmic ecosystems made up of bacteria, algae and feedstock. By manipulating their interactions we can extract valuable resources from environment to create oxygen, release or absorb heat among other possibilities.